Home › Random Stuff - Most Viewed › "The Angle" Guaranteed To Help Reduce Back Pain Immediately! Us Patented Over..
"The Angle" Guaranteed To Help Reduce Back Pain Immediately! Us Patented Over..
"The Angle" Guaranteed to Help Reduce Back Pain Immediately! 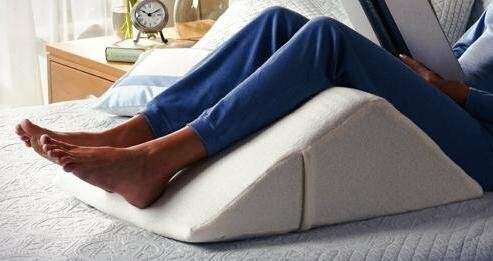 US Patented, Over 1 Million Happy Backs - Back Pain Relief, Therapy Wedge, 4 sizes to fit everyone (Large) Covered with Extra Plush Memory Foam, 100% Made in USA - For a Limited Time - Introductory Pricing. The Angle is a state-of-the-art, US-patented product designed for those suffering from lower-back pain. Drawing from current medical knowledge and utilizing modern technology, The Angle diminishes pain while it supports the structural integrity of the spine, lessening pressure on muscles and discs, allowing passive traction using the calf as counter weight. The Angle has already helped millions of people suffering from a host of lower-back problems, including fatigue, herniated or bulging discs, muscle spasms, stiffness, strain, tension and everyday stress. This unique lumbar traction device must be experienced personally to truly appreciate the therapeutic value. To experience The Angle, contact us. Dimensions 27L x 20W x 10"H Made of environmentally safe, medical-quality, polyurethane foam with a washable, hypoallergenic cotton blend cover. Size: Large large fits people from 5'5" up to 6'4" Made of environmentally safe, medical-quality, polyurethane foam with a washable, hypoallergenic cotton blend cover.The majority of us have hip flexion contractures, i.e., an ilio-psoas musclewhich has become shortened due to the amount of time we sit. The gymnasts wesee who have maintained the flexibility to touch their gluteus maximus withthe back of their head do not, needless to say, have hip flexion contractures.The manner in which one verifies a hip flexion contracture is by using theThomas position as taught by the American Academy of Orthopedic Surgeons.Because the ilio-psoas muscle is tight it becomes like a stretched rubber bandwhen we lay supine and because the weight of the leg is greater than that ofthe abdomen, the Lumbar spine is pulled into excessive lordosis and the resultis discomfort. Notice that the first thing people do when they roll to theirside is bend their hips and knees. This is the same position as when they areusing "The Angle". Placing "The Angle" under the knees flexes the hip whichbrings the insertion end of the ilio-psoas muscle (one end of the rubber band)closer to its origin in the lumbo-sacral region of the spine. This results inless tension on the muscle and the lumbar spine can return to it's neutralcomfortable position.